The CNU Summer Exchange Program at CUE is half over so far. The CNU students (majority of them majoring in Early Child Education) have completed two 3 credit courses with local CUE students and will get ready for another two 3 credit courses from next week. 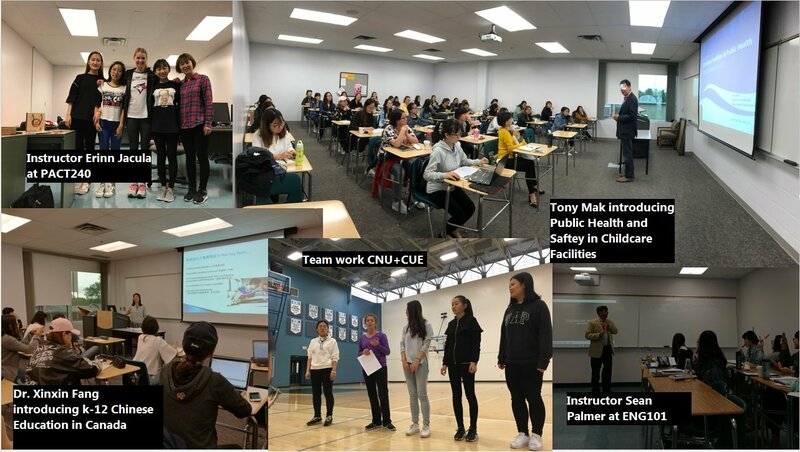 During this week’s break, besides a trip to Banff, the students also attended two lectures delivered by Tony Mak (Public Health and Safety of Childcare Facilities) and Dr. Xinxin Fang (K-12 Chinese Education in Canada). – I have learned a lot of appreciation for English poetry and short fiction. We can ask the teacher questions during the class, which is really different compared to China. – I learned cooperative learning from my current course. Compared to China, the way of teaching here uses more cooperative learning, and there are no fixed answers to questions raised by teachers. They are mixed by the answers of each group. These often need to be discussed in class, and even the assignments also need to done together. – We do a lot of team work with the local students. We have different ways of thinking, so it’s really a good way to learn new knowledge. – I have learned what cooperative games and cooperative learning are, and the benefits we can gain from them. I can also play many traditional indigenous games. I learned that all kinds of education should be inclusive. – I have learned how to analyze poems and stories from the course I am taking. I know a lot of things about English literature. This class really helped. – I have learned some analytical methods of classical English literature. I felt comfortable in class very much. We talked with our teachers like friends in class, and gained a lot of interesting knowledge so far. – I have learned that we should treat everyone equally and everybody should be treated with respect. Most important of all, we should recognize the value and ability of everyone. – After the first month’s studies, what impresses me most in the teacher’s class is the students take the main role of learning and the teacher is more of a listener. The teacher gave us plenty of time for discussion in class and gave us some suggestions. Whether we are in a game or in a presentation, the teacher always encourages us to actively participate, to encourage more exchange between us and teammates, and encourage us to know each other better. This is a good learning opportunity for me. – Our teacher will help us analyze poetry and short stories from interesting perspectives with many creative thoughts. It is quite different from what we learned in China. – In our class, I think it’s very important to cooperate and help each other. Plus, I learned to listen and communicate. This is a fun experience. – The greatest thing I learned is cooperative study! In class, we focus on cooperative games, cooperative learning, and everyone can actively participate in the activity. Everyone can have their own ideas. In addition, results are not as important as process. Learning makes me very happy! – In my English 101 class, I found that the teacher’s lesson topics were very rich. Not only through literary works, but also poetry for practicing our writing. We also used film clips to trigger our thinking and practice writing. The teacher always encouraged me, which makes me more confident. – Before the exam, the teacher told us not to worry and take it easy. It is very different from the exam oriented education in China. – I think CUE classroom teaching is very interesting and the atmosphere is very active. Team cooperation is very important. Each of us in the class here are independent, yet everyone’s ideas combine together. Communicating with each other creates mutual progress! – I learned a lot from our instructor who encourages our critical thinking and personal views. – In CUE studies, more emphasis is on group learning and autonomous learning. – I have learned a lot of movement skills, sports skills and cooperative games. We also played a lot of cooperative games so far in this course. – I studied group learning in our class. If I have a question, I must communicate with teachers and classmates at any time, which is different approach from that in China. – I have a better understanding of cooperative games, and we have played lots of games together. It is really good for Capital Normal University students. – I find that the professor is very interesting. In this class, we have lots of group work. It’s most different from the pedagogy in China. – I am taking English 101 this month. We have learned some English poetry and English short stories in this course. I think foreign literature has many interesting things and have some different places from Chinese literature. – When I started the class I realized what was in Inclusive Education. It is equality between people. In our class, we are free to form a group and discuss the tasks which are assigned by our teacher. We can speak freely and we can have our own opinions and understandings. There is no single and accurate answer. So we have a chance to express ourselves. – In cooperative games in physical education class, I have learned a lot about inclusive education. Most of the games that the teacher teaches us, the disabled can do it too, just like the volleyball game and tennis games. – This is my first time to take physical education. To be honest, if we have the class in the gym, it would be a hard time for my body. But it really is a lot of fun. It’s really different from the class in the classroom. By finishing the assignment, I got an opportunity to practice my English skills. – In regards to inclusive education, I learned there is a way to gather all kinds of people to work together under a common goal. Not only to develop abilities, but also to make people more engaged. Learning with each other and considering more aspects. – My group did an assignment and the title is inclusive physical education. I learned we should consider all the children in education and try to perform some measures to encourage everyone join in our class. We must be respectful, patient and warm-hearted to everyone in our class. – In our class, we are always sitting around the teacher, so you could ask a question anytime you like. Also, instead of doing lots of homework, professors prefer to have group discussion and write down group ideas which made us feel more comfortable and free. – The teacher uses games to teach us knowledge, not just teaching like traditional class in China. The teacher always gives us opportunities to do tasks by ourselves. I think it is a good chance for us. Through practice we can learn knowledge more clearly. – In our class, the teacher always took us to do some games or exercise by ourselves. Give us enough time and chance to show us. The homework is not only writing knowledge on the paper. She will let us work in groups，enjoying the happiness of cooperative learning. It’s very special for us and make us enjoy the class. – I think that the biggest difference between Chinese education and the western education is a different focus. China looks at the final results, and the west looks at the process. In English 101 class, our marks are divided into three parts. That means, we need pay attention to every part that we learned. – Western education pays more attention to practice, China education pays more attention to teaching theory. – After the first month’s study at Concordia, I found the teachers here can look after all the students in the class. They can answer our questions and problems very patiently. It made me feel comfortable and have more confidence.